Textured polishes are the big polish trend of the year and everyone is making it and wearing it. I own several brands of them, but so far, Zoya's are my favorite. If you don't own any, you HAVE to get at least one. Pictures don't do these polishes any justice and they are so sparkly and gritty in person. 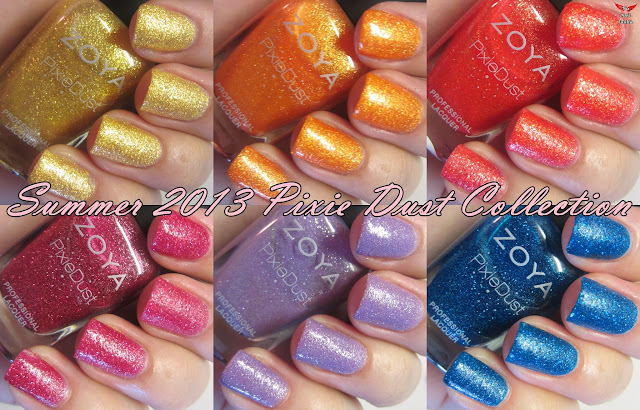 So without further ado, here are my on the nail swatches of the collection. The formula and coverage on these is great! There's barely any clean up. They don't dry quite as quickly as some other polishes, but they're worth the wait. If I had to pick the "must haves" of this collection it would be Solange, Liberty and Stevie. With Liberty being my number one fave of the collection. What do you think of these polishes? What do you think of the texture polish trend? Thanks TikiBarbie! You should see them in person. Oooooohhhhaaaaaaaaahhhhh your swatches are AMAZING!!! I don't think there was even one polish from this collection that I would not want to get right away!!! These are just so so so so pretty!! !